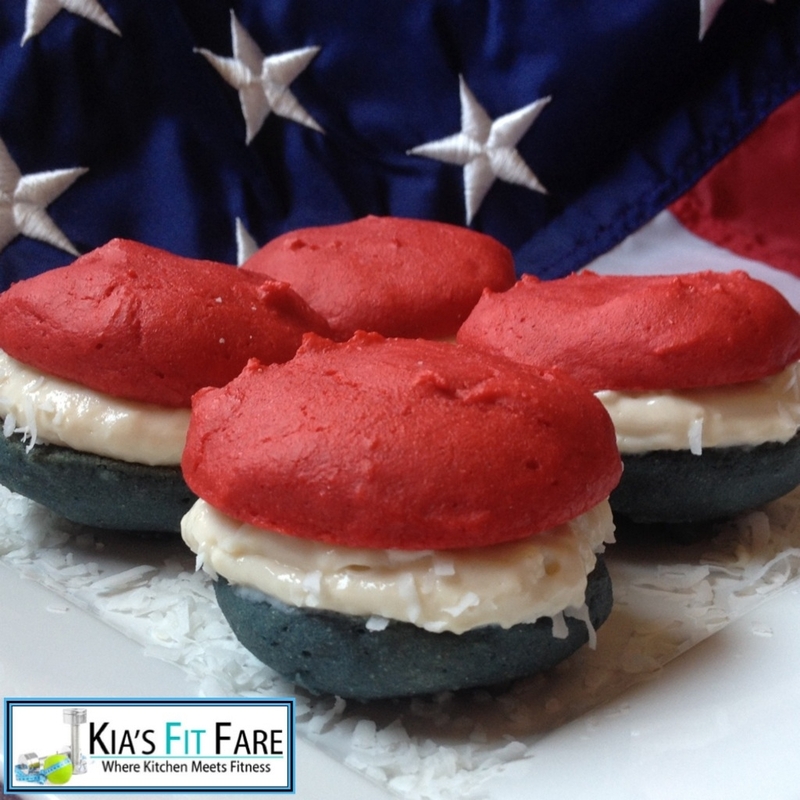 Healthy Food For Thought: (Special Independence Day Recipe) Patriotic Protein Whoopie Pies. These beautiful, multicolor Whoopie Pies would make a great addition to your 4th of July festivities or any gathering! No need to be alarmed, I used Natural food coloring for the pies (the pic does no justice forthe beautiful Blue). The cream layer was prepared with Cottage Cheese and Vanilla Protein (yes you read that right) flavored with vanilla & stevia, and placed in the freezer to create a wonderful cream. Remember, this is simply a suggestion; you can replace the Cottage Cheese layer with frozen Bananas,Yoghurt, Lite Cool Whip, really anything you can think of. I added a sprinkleof shredded coconut, which is optional, but can also be replaced with anything you desire. Enjoy!! Be Healthy, Be Strong, Nourish your Body and Live Fit!! 2. Combine all Dry ingredients. Setaside. 3. Combine all Wet ingredients. Combine Dry ingredients with Wet ingredients. 4. Divide mixture in two bowls. Add Natural Red Food Color to one bowl, addNatural Blue Food Color to the other bowl. 5. Spray pan, evenly distribute (5) spoonfuls of each mixture color. 6. Bake 8-10 mins, they cook fast. 7. Combine Cream Layer ingredients in processor, place in freezer untilready to use. 8. Remove Whoopie halves from oven, place on plate or wore rack to cool. 9. Evenly distribute Cream Layer on each Blue Whoopie half. Place Red Whoopie Pie Half on top of cream.